Pattaya-Hua Hin-Bangkok featured as a perfect setting for business-leisure harmony, where meetings and business events can be more fun and productive turning an ordinary business trip to Thailand a Vibrant Journey to Business Success. From 15 to 19 August, Thailand Convention and Exhibition Bureau is organizing their annual International Media Familiarisation Trip, or IMFT2017 to provide a first-hand experience of Thailand’s readiness and capability as a regional MICE hub in Asia. Being held under the theme “CONNECT Thailand: Kingdom of Bleisure,” the trip showcases Bleisure destinations, Pattaya, Hua Hin, and Bangkok to 35 international media from 16 countries, with Kongres Magazine proudly being one of them. Thailand Convention and Exhibition Bureau (Public Organisation) casts a spotlight on the new MICE landscape, Pattaya – Hua Hin – Bangkok, underpinned by the upcoming developments under Thailand 4.0 economic policy which include the improvement of connectivity, the mega infrastructures, along with the incentives to enhance new investments in the Eastern Economic Corridor (EEC). The initiatives are expected to magnify the recognition of each established ‘Bleisure’ destinations, while the bureau foresees a great potential in the growth of MICE and the income distribution which to drive MICE into a key sector in developing the country. Mrs. Supawan Teerarat, Vice President of TCEB’s Strategic and Business Development, said that Thailand is moving forward in all area of development to steer the national economy to Thailand 4.0 era. The government encourages public and private partnership along the economic transition with policies that enhance new business environment, the innovation, as well as the promotion of hard and soft infrastructure. Thailand 4.0 inspires and encourages business activities and this, in turn, makes the country a venue for meetings linked to trade development, technology and research. The uplift of the country’s economy will directly benefit MICE industry. The three vibrant cities feature potential growth in MICE. Pattaya, the country’s favourite sea side resort for business and leisure, will be benefited from the upcoming mega projects in the Eastern Economic Corridor, located in its neighbourhood. The next major economic zone of ASEAN will see more that 1.505 trillion baht (USD 43 billion) of the new investment during the next five years. Key infrastructure projects that will enhance connectivity and business activities in the area include an upgrade of U-Tapao Airport and Laem Chabang. High-speed eastern rail route development; double track railways development; and highways and motorways expansion. Future more, the economic corridor is expected to be the powerhouse for ten targeted future-industries under Thailand 4.0 model attracted by the government tax incentives. Adding the growth of business activities to the sea, sun and beachside fun, Pattaya features endless opportunities for Bleisure travellers. Recognised as one of Thailand’s leading MICE cities, the destination is home to a world-class multipurpose convention facility, myriad meeting venues, hotels, and seaside attractions. New facilities for Bleisure activities in Pattaya include the Nongnooch International Convention and Exhibition Centre – with a large auditorium and more than adequate seating capacity for seminar, KANN Show – a live cinematic experience inspired by Thai pieces of literature; and Health Land Spa Pattaya – a one-stop landmark for total wellness. Conveniently linked with Pattaya by a two-hour ferry ride via the Gulf of Thailand, and two and a half hours drive from Bangkok, Hua Hin – the royal heritage beach resort town traces its aristocratic roots to 1920s when royal summer residences established in the area. Today, Hua Hin is home to luxury hotel chains. The town is popular with Thai and foreigners as business events destination that can cater for exclusive and luxury activities with the heritage theme. In addition, the destination features numerous world-class golfing resorts, spas, outstanding seafood restaurants, and a vibrant night market. The southern gateway city is expected to see a development of high-speed train route, 211 km from Bangkok in the near future. The five years construction project, worth 94.67 billion baht (USD 2,704 million), is being assessed for feasibility. the quintessential Asian metropolis, offers anything Bleisure travellers could desire. The Thai capital city is a hub for Thailand’s MICE industry with abundant choices of world-class conventions and meeting venues, accommodations, shopping centres, fine dining and entertainment options. The city is expanding its development of an urban rail transit network serving the Greater Bangkok area. An improvement of the mass transit system will offer visitors an efficient transportation as well as layers of economic benefits to further strengthening the county’s MICE hub. Also, the new development of Siam Synergy, with a collaboration of property in Siam District, will further strengthen Bangkok as a key strategic economic, commercial hub and one of the world’s most comprehensive and diverse lifestyle centres. “Derived from TCEB’s brand communication campaign, we present ideas for the Bleisure route and theme meetings which are all possible for MICE events in these cities. Combining the three destinations, we introduce aspects of the Thai journey through luxury, cultural, culinary, and CSR experiences to show that Thailand can transform ordinary business events into a memorable and endearing success”, added Mrs. Supawan. For the IMFT2017, TCEB has been working closely with EEC and its strategic partners namely Airport Authority of Thailand (AOT) and the Thai Airways International (THAI) to emphasise and expand opportunities for the MICE business in the Thai Bleisure destinations. Dr.Cholachit Vorawangso Virakul, Executive Director of the Eastern Economic Corridor Office of Thailand, said that IMFT2017 reinforces the collaboration between EEC and TCEB. The event provides opportunity for EEC to share information about the special economic hub, which is a flagship project under Thailand’s 20-Year National Strategy and Thailand 4.0 Policy, to overseas MICE and travel trade media. The key focus areas include: 1) the development plan; 2) the investment of basic infrastructure within the EEC to serve the growth of industrial sector which includes the establishment of eco-cities following the “Smart City” model that will generate a benefit for MICE industry in the future; and 3) the network enhancement with TCEB and MICE industry to showcase Thailand’s economic development to the international business community. Mrs.Usanee Sangsingkeo, Executive Vice President, Commercial Acting President of Thai Airways International Public Company limited said that “The national carrier of the Kingdom of Thailand, THAI, and has a fleet of 96 aircraft, serving 76 destinations or 77 airports in 32 countries. THAI currently operates an average of 1,086 roundtrip flights per week on domestic, regional and intercontinental routes in Europe, Asia, and Australia. In addition, THAI will launch flights to Vienna as the newest destination in Europe in November 2017. 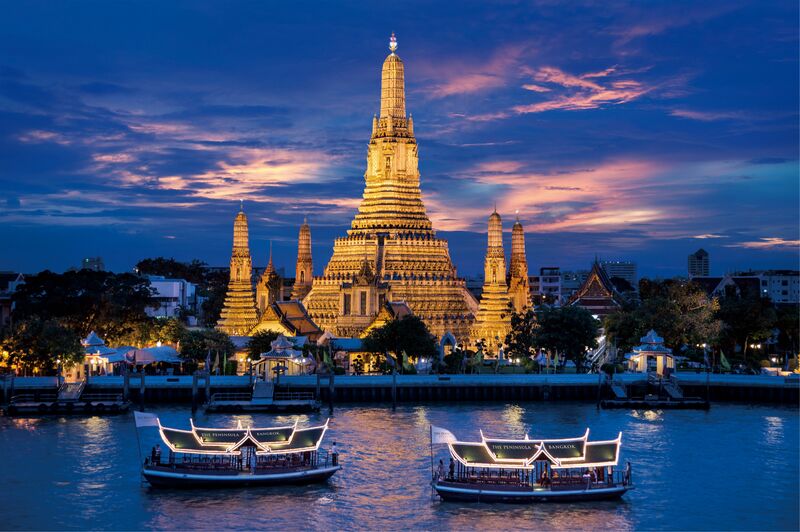 Over the past 57 years, THAI has received countless international awards in recognition of excellent products and services as one of the world’s most admired carriers in research carried out by leading travel magazines and passenger surveys. TCEB expects that in the 2017 budget year (October 2016-September2017), there will be a total 1,109,000 international MICE visitors generating revenue of 101 billion baht (USD 2,885.7 million). Additionally, we will be able to meet the target of driving the MICE industry to be a key player in creating prosperity, distributing income to the regions through the MICE industry, and creating strength and sustainability for the economy of the country. In 2017, Thailand is preparing to host of several important international conferences, such as 2017 PCMA Global Professional Conference – Asia Pacific, between 28th – 31st August in Bangkok, UIA’s Associations Roundtable Asia-Pacific 2017, between 21st – 22nd September in Chiang Mai, IT&CM Asia & CTW Asia Pacific 2017, 26th – 28th September in Bangkok, which is an important trade show for Asia that Thailand will be hosting for the 16th time, SIGGRAPH Asia 2017, between 27th – 30th November in Bangkok, which is a world-class seminar and exhibition on computer graphics and animation, Metalex 2017, between 22th-25th November in Bangkok, which is ASEAN’s largest international machine tool and metalworking technology trade exhibition and conference. Additionally, in 2019, Thailand has won the rights to host global event: SITE Global Conference 2019, which is the international conference of organisations in incentive business.